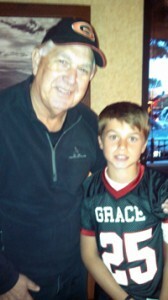 Pastor John McIntosh and his grandson, Brayden. John McIntosh, associate pastor at Grace Brethren Church, Simi Valley, Calif. (Jordan Bakker, senior pastor), sent along news of the youth football program in his community. His grandson, Braydon, played on the the championship team for Grace Brethren. Here are photos of the Superbowl win over the Oxnard Knights on Saturday, November 16, in Westlake, Calif. Brayden played outside linebacker. 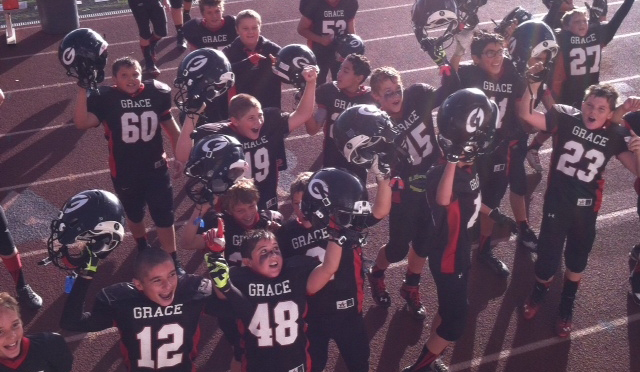 The Grace Brethren Lancers, Junior 1 Division (ages 10-12) defeated the Oxnard Knights 30 – 0 for the Superbowl win. His parents are Grace College alumni, Derek and Stacey McIntosh.